You may have seen quite a few reviews about the following product, but I also wanted to share my view :). Often, the way we use our tools impact the way we perceive new products on the market. Especially in the case of palettes this seems to be the case. 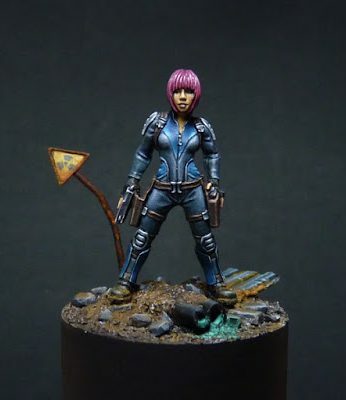 For that reason, I wanted to share my experiences with the Redgrass Games Everlasting Wet Palette. As many of you know, I have been using a wet palette for quite some time. 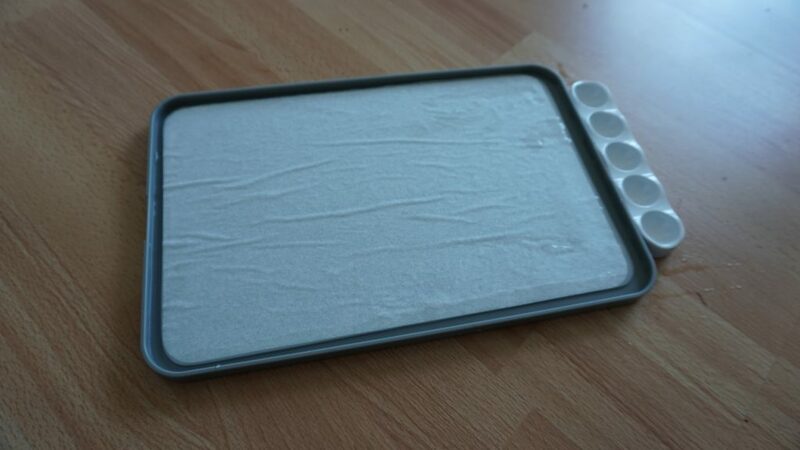 My first wet palette was made of a flat IKEA box with a lid (about 17×22 cm), a sponge and cheap baking paper. It worked quite well, but I wanted to try something better. I started experimenting with the Masterson Art Sta-Wet Handy palette, and simply could not handle it. Preparation of the palette paper was too much work and my paint dried out too fast and seeped through the paper. I continued using the palette, as I liked the shape, but started using the baking paper again. 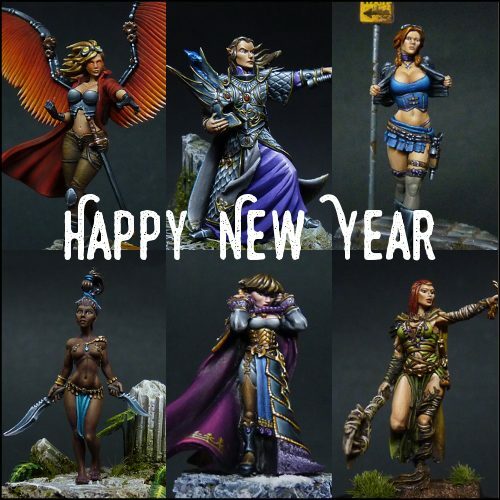 When I saw the Kickstarter from the Everlasting Wet Palette from Redgrass Games I was intrigued. In the end, I didn’t back, mostly because my initial reaction was that the palette would be too small for me. Then some time ago, I saw the pre-prder and the new Studio XL palette (20 x 30cm) drew my attention. Not only because it was bigger, but let’s say I’m a bit of a sucker for a nice blue ;). I wanted to give it a go to see if I like it more than my trusted palette. I was quite impressed by the box in which the product came, it makes it look like a quality product. On the backside of the box are instructions to use the wet palette. Very useful! In case the palette doesn’t work for you, at least you know you have followed the correct instructions. Of course, the box says nothing yet about the contents. Inside the box you can find the palette iself, which consists of a grey bottom and a blue lid. There is an elastic band to keep the palette together when travelling, there are 2x 50 sheets of hydration paper sheets and 2 sheets of hydration foam, and the “wavy”, to be used as a non-wet palette on the side. Again, the contents look very neatly packed. 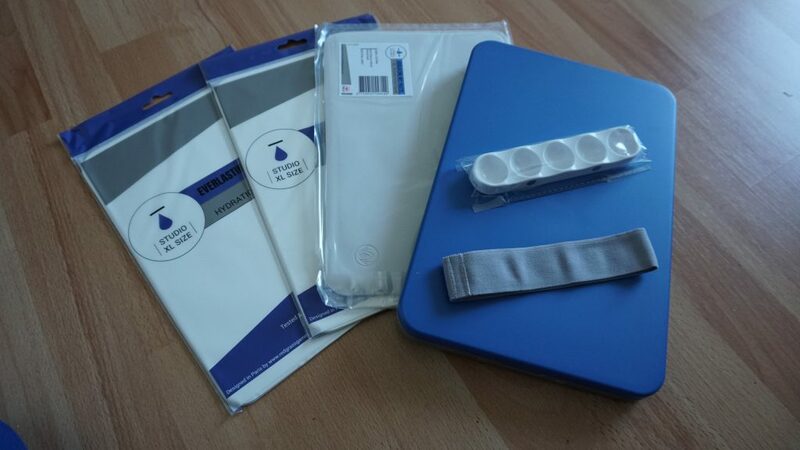 The hydration sheets and hydration foam are also separately available on the Redgrass Games store, in case you will run out of any. Palette ready to be tested! The instructions on the box were very clear. Simply place the foam in the palette and add water under the foam is wet and there is a bottom layer of water in the palette. Do not add too much water, or you will drown the paper. Then add the paper and softly press it on the foam. Don’t turn it over! If the paper curles up a bit, as mine did, you can simply use wet your index finger a big and strokes the sides down. After that, no more curling. The foam fits the palette very well, there is a little room to spare. The hydration paper exactly fits the foam, which is great is it will prevent air from coming under. The palette looks sturdy and it closes really well. The only way to properly test the palette is to slap on some paint and get to work! 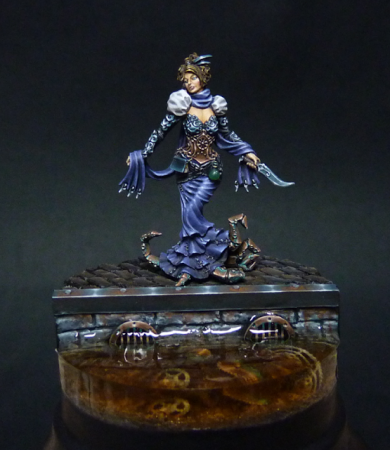 I used a bunch of different paints and brands: Scale 75, Vallejo Model Color, Vallejo Game Color, Reaper, Scale 75 inks, and Golden Artist Acrylics. In the picture above you can see what the palette looks like after half a day of use. Just to note, it was a super hot day (30 degrees inside)! Some of the colours seem to have dried up a bit, especially the reds at the bottom, but actually they can be re-activated by adding a little bit of water. I noticed that especially the bigger puddles of paint stay really wet and could be used all day. With my regular palette, I would’ve had to add some new paints already at this point. 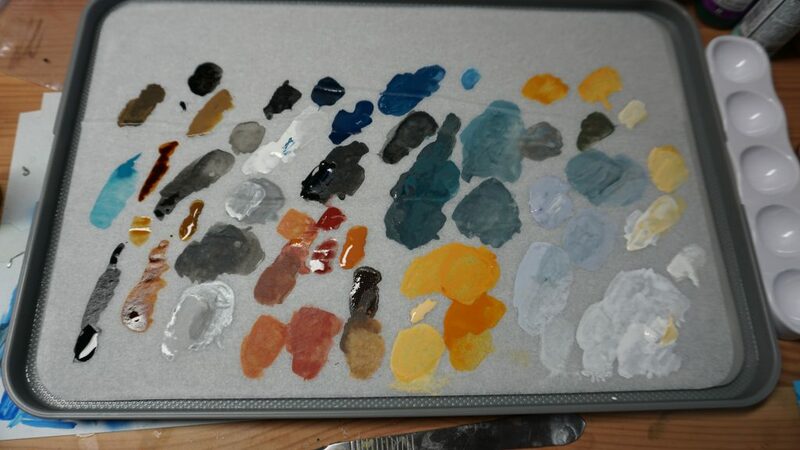 This palette was still good to go at the end of my painting session. I have never been able to use a palette for a second day. Somehow, things always go wonky. But, of course I had to try it out with the Everlasting Wet Palette. Four days later I had a look at the palette, not knowing what I could expect. 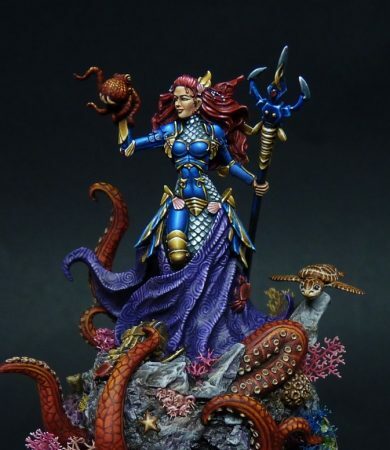 I am incredibly impressed! It looks almost exactly as I had left it. Even more, some of the colours (see the bottom reds) seem to have been revived somewhat. Some colour have separated a little (for example the blues), but a little mix with a brush and they are as brand new. My old palette would give me chunks, but these paint puddles are smooth. Some colours, mainly the Vallejo ones, have separated a bit more. They can also be revived, but they are now a little too watery for my taste. 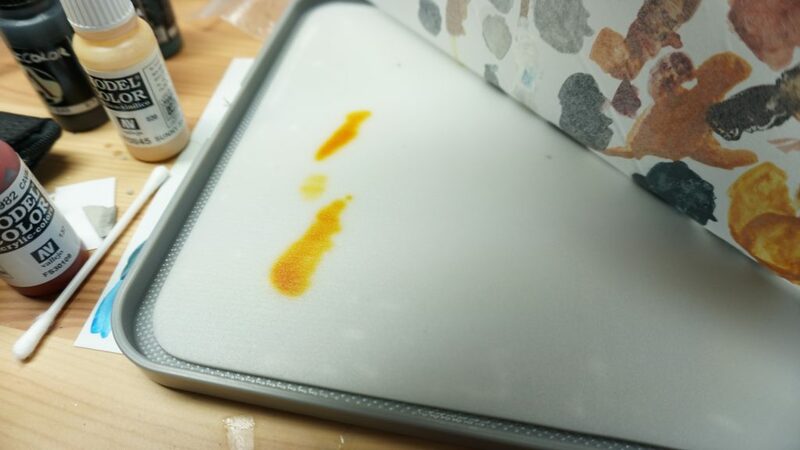 The colours that I diluted for glazing are dried up too much, but that is no problem as the original paint is still usable on the palette. 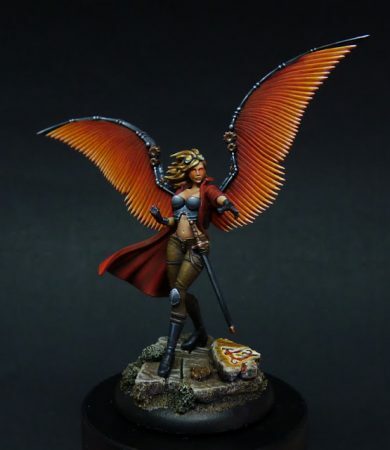 I could definitely use the palette again for the next painting session! 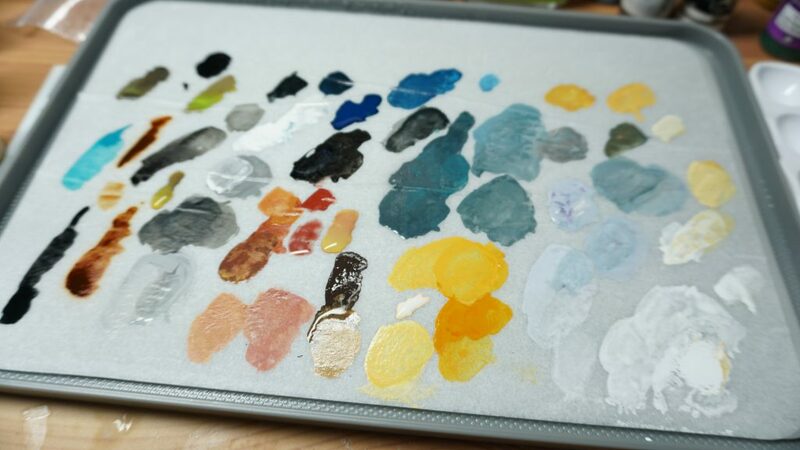 With my old palette, paint would sometimes leak through the paper when leaving it for a few days. Inks leaked through the palette. I checked underneath the hydration paper and while most colours did not leak through, the inks did. I think this is the property of the inks. The other colours did not leak. Now I found the great use of the “wavy”, as it would be super useful to use for inks! I personally don’t mind some colours on the foam. but likely, you will be able to wash it out as long as the foam is still wet. Overall I am super impressed with this palette!! 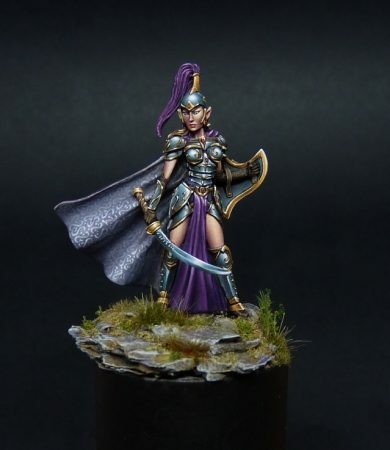 The palette seems to work really well with my method of painting and blending. My old palette paper would sometimes break when I mixed colors on it too much, but this paper seems to be more sturdy. I love how it preserves my paints, through the day while in use and for several days after being stored. 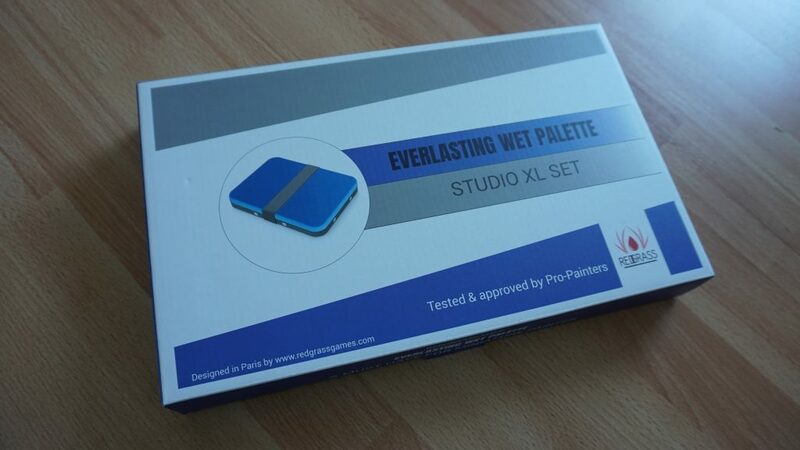 I have not yet tested it for more than four days, and “everlasting” would of course be a bit too much to ask for, but it certainly keeps my paints longer than my old palette. I will certainly continue to use this palette! I hope you enjoyed my view on this palette, let me know if you have any questions!